Sunday January 7th 1883 I worked about the house till after dinner and read in the afternoon and evening. 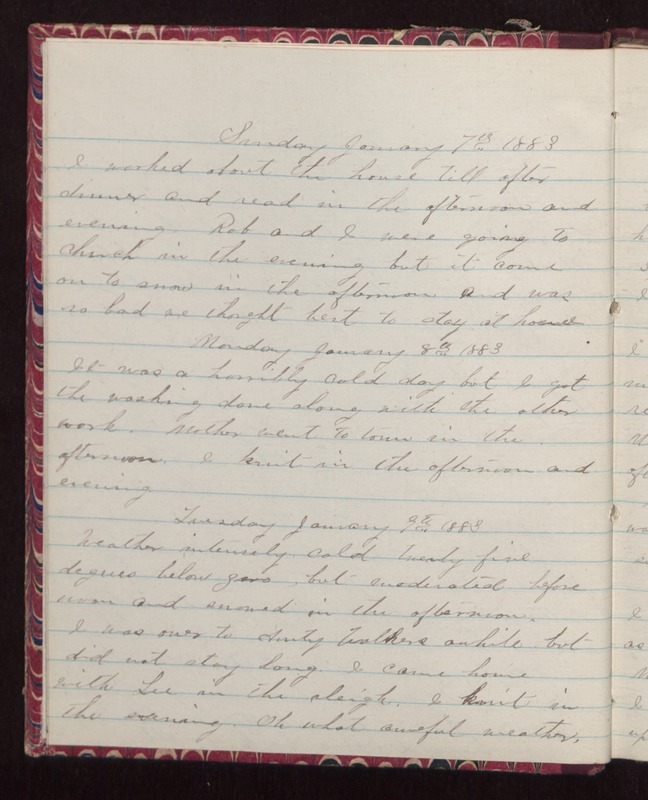 Rob and I were going to church in the evening but it came on to snow in the afternoon and was so bad we thought best to stay at home Monday January 8th 1883 It was a horribly cold day but I got the washing done along with the other work. Mother went to town in the afternoon. I knit in the afternoon and evening. Tuesday January 9th 1883 Weather intensely cold twenty five degrees below zero, but moderated before noon and snowed in the afternoon. I was over to Aunty Walkers awhile but did not stay long. I came home with Lee in the sleigh. I knit in the evening. Oh what awful weather.